Provide a friendly greeting and departure to your guests using this Esschert Design Welcome/Goodbye Rubber and Coco Fiber Doormat. The hardy materials and classic shape of this mat lend a wonderful look to your doorway, while celebrating your guests. A wealth of rubber scrolls and fleur-de-lis shapes create a frame, completed by a rectangular, rubber border. The center of the piece houses a bit of coco fibers, printed with both "Welcome" and "Goodbye" in all caps. The words are oriented opposite of each other, inviting guests in to the home when they arrive, and bidding them farewell as they exit. The rubber and coco fiber construction not only remains durable; it also provides plenty of spots to wipe shoes for clean floors indoor. 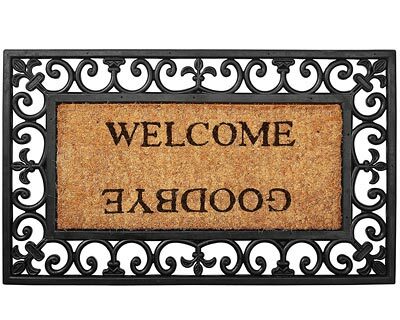 Add a fun phrase to your doorstep with this Welcome/Goodbye Rubber and Coco Fiber Doormat.